I love a good Indo-British food mash up. Nankatai are an exotic take on Scottish shortbread popularised by Parsi bakers in the wealthy trading city of Surat in Gujarat. They are yet another example of the rich multi-cultural food influences of the Indian subcontinent. Nankatai are eggless and so suitable for vegetarians which are in the majority in the strict Hindu state of Gujarat. This recipe comes from Meera Sodha and is a family recipe from her Aunty Dina. 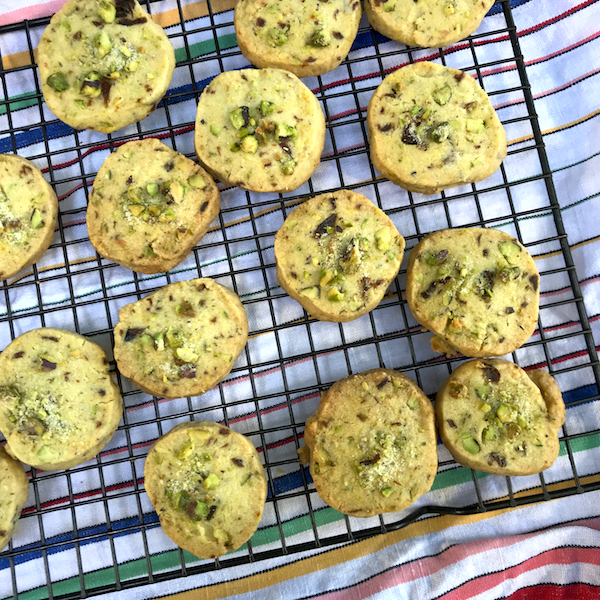 It’s unusual because of the addition of chopped dates which along with the pistachios give it a lighter, airier texture to a traditional Scottish shortbread biscuit. I made these nankatai as one of biscuit selection in my Christmas bake off this year. 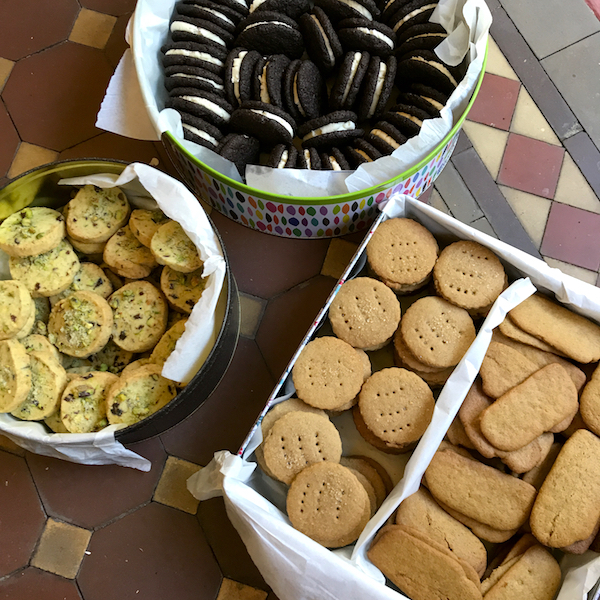 I like to bake a smorgasboard of biscuits for at Christmas time to give away as presents and to contribute to the overall sense of plenty. There is nothing like a small sweet biscuit with a cup of tea when recovering from the excesses of Christmas celebrations. Last Christmas I didn’t have the energy or time for my traditional Christmas bake off and I just made a few batches of my friend Jenny’s, family recipe for old fashioned shortbread. This year I got back my baking mojo and made three old favourites graham crackers, Swedish ginger thins, and oreos along with this new discovery. These nankatai are good! Not too sweet and with the pistachios and dates they’re practically a health food. Best of all the dough can be made ahead and baked off in the early morning cool. This make ahead component is critical when you’re baking in the heat of humidity of an Australian summer. The oreos don’t follow this rule but they are such a rock star of a cookie, they are worth the extra trouble, plus I had to make the oreos especially for my niece who was so disappointed with my low baking turnout last year. It’s hard to beat a homemade oreo but these nankatai come close. Grind pistachios coarsely in a food processor, keep aside a couple of tablespoons for sprinkling. Grate orange zest over 100 grams of castor sugar and mix together with flours, dates, salt and pistachios in a large mixing bowl. Chop butter into one cm cubes and add to flour mixture. Rub butter through flour mix with your hands. Knead until the flour and butter come together in a smooth dough but be careful not to overmix. Preheat oven to 160C and line two trays with baking paper. Use a very sharp knife to cut logs into 1cm slices. Place cookie dough rounds on baking sheets about 3cm apart. Sprinkle rounds with leftover sugar and crushed pistachios. Bake in oven for 20-25 minutes. Keep a sharp eye on them, you want them to be golden but not too brown. Cool on tray before removing to a wire rack and cooling completely. Store in an airtight tin. The nankatai will last for a week or two in a tin.